Who is ready for Halloween? I sure am! Any excuse to eat lots and lots of candy, like candy corn! I know its not everyone's favorite, but I don't discriminate against anything with sugar in it. 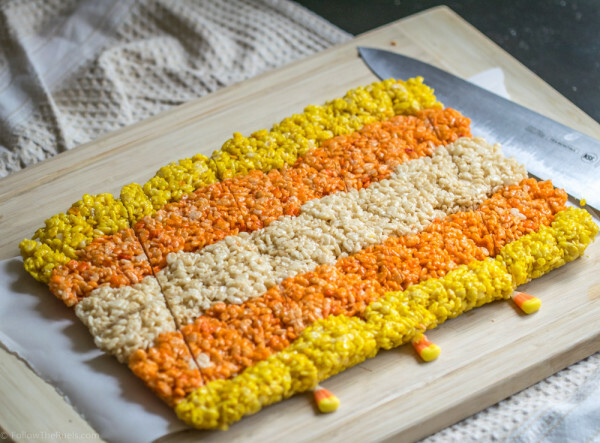 But even if you don't like candy corn, you will still love these Rice Krispie treats because they only LOOK like candy corn. They don't taste like them. I wanted to make something fun yet simple for a Halloween party this weekend. I stroll through the candy aisle inspired this candy shaped version of the classic Rice Krispie treat. To make these tri-colored only required a little bit more effort. I started with the standard recipe you can find on the back of any Rice Krispie box. I then divided up the mixture into 3 equal portions and dyed 2 of the portions: 1 orange, 1 yellow. I started with the un-dyed portion and formed into into a long log and placed in down the center of a baking dish. I then took the orange portion and spit it half, then spread it out on either side of the white portion. Then repeated that step with the yellow. Once I was happy with the proportions, I pressed everything together into one big section. After letting the Rice Krispie Treats cool for about 30 minutes, I cut them down the center, lengthwise. Then cut on a diagonal everything 3 inches. I measured out 3 inch sections from end to end on either side. I then cut from the corner of one side to the 3 inch mark on the other, then kept cutting until I got 16 triangles. Hopefully that made sense. It took me a few attempts to figure out the best cutting method. I started trying to mark out the cuts with bakers twine. Then was going to attempt free hand. Ultimately I decided to use the candy corn to help me mark out exact measurements. 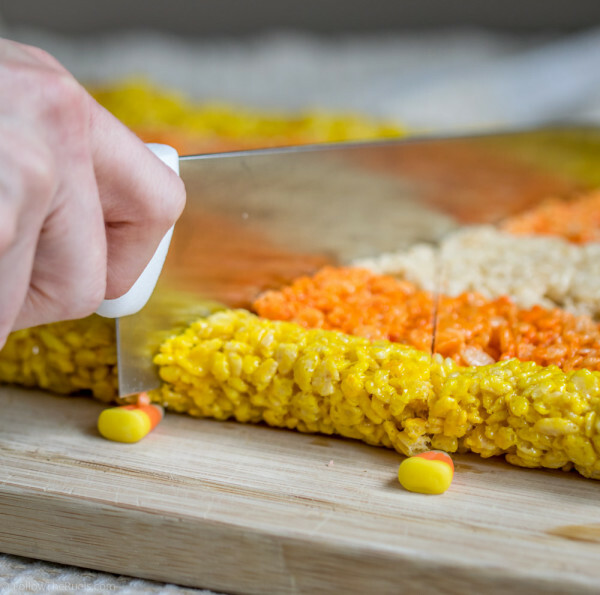 Triangle rice krispie treats in orange, yellow, and, and white. One tip for making sharp cuts on your Rice Krispie treats is to spray your knife with a little oil or baking spray. It will ensure that none of the sticky marshmallow gets stuck and starts pulling apart all your hard work! 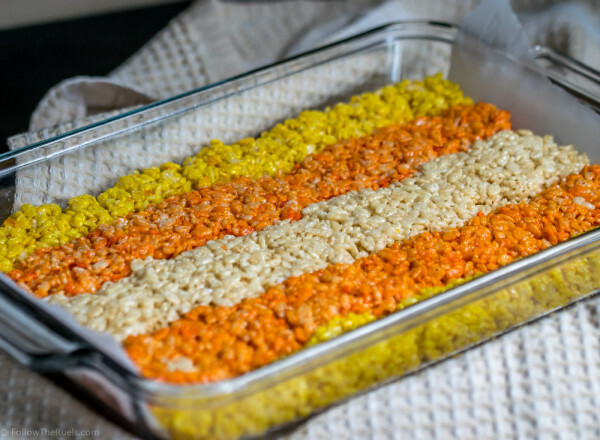 I hope you try this spirited version of Rice Krispie treats this Halloween or for any party you may have coming up in the next couple weeks. Candy corn is appropriate during all Fall. Prepare a 8" x 12" baking dish with cooking spray and/or parchment paper. In microwave-safe bowl, microwave butter and marshmallows for 2 to 3 minutes, stirring part way through. Once melted, stir until smooth. Divide mixture into three equal portions. Mix one portion with orange dye and one with yellow. Form the un-dyed mixture into a long strip and place in the across the center of the baking dish. Halve the orange portion, and form into two long strips and place on either side of the un-dyed strip. Repeat with the yellow portion. If mixture becomes to stiff to form, heat in microwave for 15 to 20 seconds. Let cool for at least 30 minutes. Once cool, remove the Rice Krispie Treat block from the dish. Cut down the center, lengthwise. Then measure down each side and mark every 3 inches. Cut on the diagonal every 3 inches to form triangles.